Ka Liko is barking at The Big Bobber Floating Cooler again. I can't blame him, being terrified of the thing. It's big and, well, looks like a bobber. See below. The DNB had the great fortune to win The Big Bobber Floating Cooler at our neighborhood Block Party. I have a sneaking suspicion that the raffle gift wasn't entirely new when donated. According to the company website (www.thebigbobberfloatingcooler.com, wouldn't you know? ), the thing has "Thousands of Uses" and is currently on sale for $39.95 - they're practically giving it away. I won an Ikea wine opener (do they know about our drinking? ), which, presumably, comes pre-assembled, but you never can tell. "There's bound to be an extra dowel in there somewhere," suggested our next-door neighbor. I was met with much anticipation as we greeted the neighbors at the party. Many of them met the DNB when he first moved in (and yet were happy to see us! ), and this night has been referred to as my "trial by fire" on a number of occasions. I was pleased that it wasn't at all - the neighbors are all tremendously good-natured with most excellent senses of humor. See The Big Bobber Floating Cooler, above. The ladies in charge planned a number of games, including egg- and water balloon-tosses, which can only ever end badly. During the egg race, the distinguished professor who lives across the street heckled the neighborhood children: "Focus, Cyrus! Stop chewing your gum and focus!" "By the time you get the egg to the other side, it'll be boiled!" "Don't look around, focus!" It was a fun night, and I was glad to see for myself what a spectacular block we've found ourselves on. 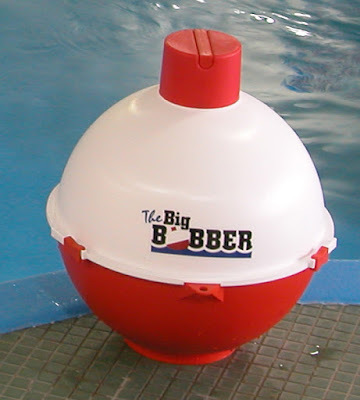 I'm off now to ponder the "Thousands of Uses" to which we could put our Big Bobber Floating Cooler. Re-gifting to the DNB's family was my first thought, any other suggestions? Use #2: Re-gifting to Dana.